The UK’s swimming pool industry are now deeply in the detail of having to deal day by day with new building control regulations. The new regulations now include specific reference to indoor swimming pools within the general scope of the regulations and now include guidance as to how the energy demands on an indoor pool should be considered. The revised ‘Part L: Conservation of fuel & power’ and ‘Part F : Ventilation’ will now be applicable to all projects unless plans were submitted to the Local Authority prior to 1st October 2010. Paul Scott, Technical Director of Heatstar, has specialised in the design and manufacture of swimming pool heating and ventilation systems for over twenty-five years and has provided for spn (Swimming Pool News) readers an insight into the implications onindoor swimming pool design. There has already been reasonable coverage over the requirement of meeting a thermal insulation value of 0.25 W/m².K for the pool shell, typically necessitating insulation as part of the construction process. Accordingly, he now concentrates upon the other implications for indoor pool design contained within these new regulations, some of which are far ranging and significant. L1A: Newly designed / constructed dwellings. L1B: Existing dwellings where refurbishment has taken place. L2A: Newly designed / constructed buildings which are not dwellings. L2B: Existing buildings, which are not dwellings, where refurbishment has taken place. A dwelling basically means a single home, in which people are expected to live and sleep. An indoor pool which is part of, or associated with, a domestic home will be encompassed under the dwelling regulations. 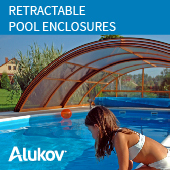 All other types of indoor pools, such as hotel, club or leisure centre etc will be considered as not a dwelling. 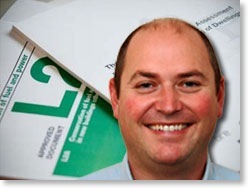 These energy related building regulations are not new and they were first introduced in 2002 and revised again in 2006. They have become progressively more stringent in terms of energy saving / CO² emission reduction. 2006 reduced 2002 rate emissions by 25% and the latest revision intends to reduce CO² emissions by a further 40%. For example, thermal insulation value requirements for the walls, roof etc have all been improved, as have required fuel boiler efficiencies. The primary focus of Part L is CO² emission reduction, above all else. A new building must now meet a ‘Target Emission Rate’, which is set by central government, which relates to kg of CO² produced per m² of floor area per year. For both domestic and non domestic applications Part L now includes a direct instruction upon how an indoor pool hall should be considered as part of the energy efficiency calculation for the whole project– basically that the pool room must comply with the same energy requirements as the rest of the project, with the exception that the area taken up by the pool water surface should be treated as a normal floor, theoretically offering the same thermal insulation value as the rest of the pool surround. Within the new Part L, there is now a requirement for all "fixed building services" to be "commissioned by testing and adjustment as necessary to ensure that they use no more fuel and power than is reasonable" and the main contractor will be required to provide Building Control with "a ‘notice’ confirming that the fixed building services have been commissioned in accordance with a procedure approved by the Secretary for State". From the outset of the project, the builder would initially be expected to prepare and supply Building Control with a ‘commissioning plan’, highlighting those systems where commissioning will be required, including the pool room dehumidification, air heating and ventilation system. "The owner of the building should be given a set of operating and maintenance instructions aimed at achieving efficiency in the use of fuel and power, in a way that a layman can understand. The instructions should inform the owner how to operate the system efficiently." "The instructions should explain how to make control adjustments and what routine maintenance is needed to enable operating efficiency." "where condensing boilers are fitted, systems should be designed so as to provide low primary system return temperatures, preferably less than 55°C, which maximise condensing operation." This has design implications for swimming pools where some systems are still designed / rated using 80°C flow temperatures. Part F is the document which relates to the provision of ventilation and air distribution etc. Specific fan power is the term used to assess the efficiency of a ventilation system and Part F now contains more stringent efficiency requirements. 1.5 Watts of power per 1 Litre per second of air volume moved : 1.5 W/(l/s.). This would relate to the maximum power permissible to move the stated quantity of air. First, that any fan with a motor power greater than 1.1 kW must be fitted with a variable speed control. Secondly, that such a fan should achieve the same efficiency operating at 25% power as at 100% power. For the majority of non-domestic swimming pool applications, the main fan would normally be more powerful than 1.1 kW and this new regulation aims to prevent the future application of the conventional single speed or two speed fan motors which have been applied in the past. There has been a general concern that typical simple domestic ventilation equipment has historically been installed by general trade people who are perhaps not particularly knowledgeable about ventilation. As buildings now have to be more air tight, the need for mechanical ventilation to work correctly has become more important. Now even kitchen hoods and toilet extract fans have to be ‘commissioned’ and air flow tested to demonstrate that they are achieving the ventilation rates intended. In general, the provision of any ventilation has become a far more serious and scrutinised endeavour. "Fixed systems for mechanical ventilation and any associated controls must be commissioned by testing and adjusting as necessary to secure that the objective is met". "All fixed Mechanical Ventilation Systems, where they can be tested and adjusted, shall be commissioned and a commissioning notice given to the Building Control Body." "For Mechanical Ventilation Systems installed in new domestic installations, air flow rates shall be measured on site and a notice given to the Building Control Body." Within the 'Domestic Ventilation Compliance Guide', it describes that the ventilation air flows should be “measured using a vane anemometer, which should be calibrated annually (by a UKAS) to an accuracy of +/- 5% and the air flow recorded in L/sec." In cases where fresh air ventilation is provided and a method of heat recovery is employed, the new regulations stipulate much improved efficiency, with a minimum ‘dry’ heat recovery efficiency of 70% now being necessary and this must be rated using the exacting standards and methods stipulated in BS EN 308:1997. In respect of ‘dry’ this means no latent energy content should be considered within the calculations. For a swimming pool system over 70% 'dry' efficiency is a tall order and challenging to achieve and extensive new ventilation product designs are required for 2011 in order to comply with the stipulations of the new regulations. It is important to note that, on domestic applications, it is still permitted to use systems which provide fresh air ventilation without employing any heat recovery method – it is only those systems which claim to provide heat recovery which would be subject to the new regulation standard. For all non domestic applications, the efficiency regulation is a little more relaxed at 50% reclaim efficiency. However, it is stipulated that heat recovery ventilation must now be incorporated in all non-domestic applications. This will notably restrict the type / format of unit or system which can now be selected for any non-domestic application. These accompanying support documents to the building regulations are where the detail is to be found in respect of what the respective climate control system is expected to provide in terms of efficiencies. • Domestic building services compliance guide 2010. • Non-domestic building services compliance guide 2010. • Domestic ventilation compliance guide 2010. Heatstar, as one of the leading manufacturers of swimming pool dehumidification, heat recovery, ventilation and heating systems, have made a thorough study of the new regulations and have taken all necessary measures to ensure that these new building control regulations do not cause clients undue hassle. Forming the heart of Heatstar’s response, at SPATEX 2011 they launched the new Phoenix EC system, which has been purpose designed to be fully compliant with the new regulations for both domestic and non-domestic pools. This new system features Heatstar’s low energy, variable speed fan technology and specially engineered and enlarged heat recovery modules. At the quotation stage, Heatstar will provide clients with a clear assessment of the applicable building control regulation requirements and a compliance report for the proposed Heatstar system. At the quotation stage, Heatstar will provide clients with a commissioning requirement statement for the proposed pool room system, which can be included within the ‘commissioning plan’ for the whole project. Heatstar will clearly highlight and confirm the Specific Fan Performance of the proposed Heatstar system. On new projects, Heatstar have updated their thermal insulation value terminology to match the ‘K Values’ used within the new building control regulations. On new projects, Heatstar have updated their thermal insulation values to match the requirements of the new building control regulations. Heatstar have updated their boiler efficiency ratings to match those used within the new regulations. Heatstar have updated their LPHW flow temperatures and heat output ratings to match those used within the new regulations. On new projects Heatstar have updated their heat load calculations to make allowance for the benefit of the new thermal insulation requirement. commissioning report in line with the format required under the new regulations.